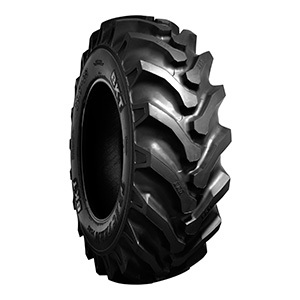 TRAC FARM PLUS is a rear tractor tire specifically designed for farming applications. The tire features a deeper tread with dual angle lugs and extra rubber at the center to ensure both excellent traction and a comfortable ride on the road. The special tread design provides more contact for better stability whereas the strong casing offers excellent resistance against stub penetration. TRAC FARM PLUS is made of a superior tread compound optimizing wear and tear resistance and ensuring a longer tire life-cycle.